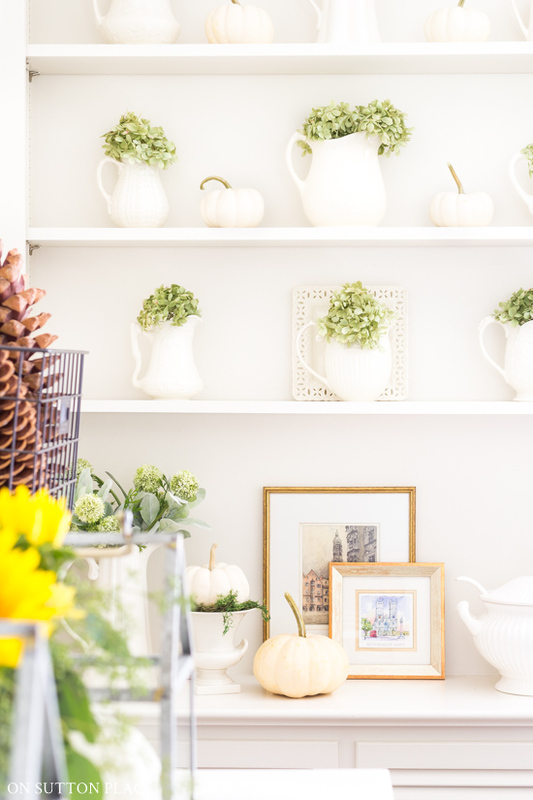 In this post: Simple & natural DIY fall decor ideas for your home. Use the colors of the season along with neutrals to achieve your own signature style. 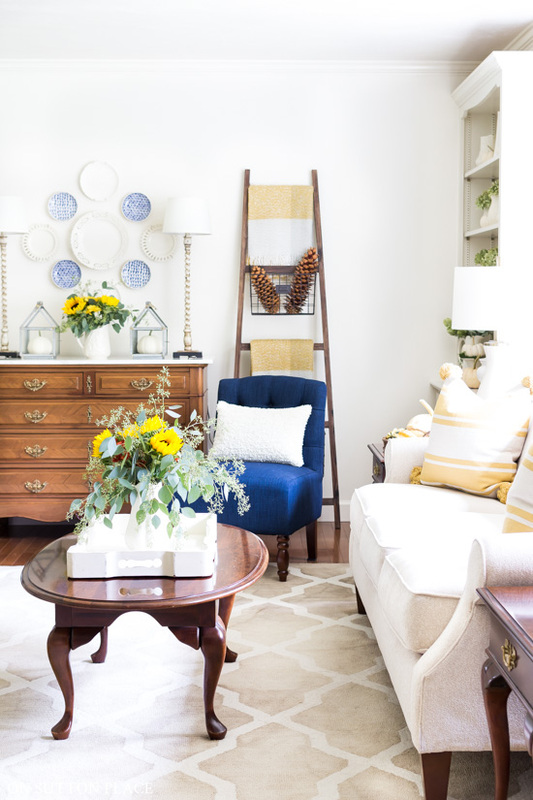 Decorating for the seasons is one of my favorite things to do…but I like to keep things simple and quick. 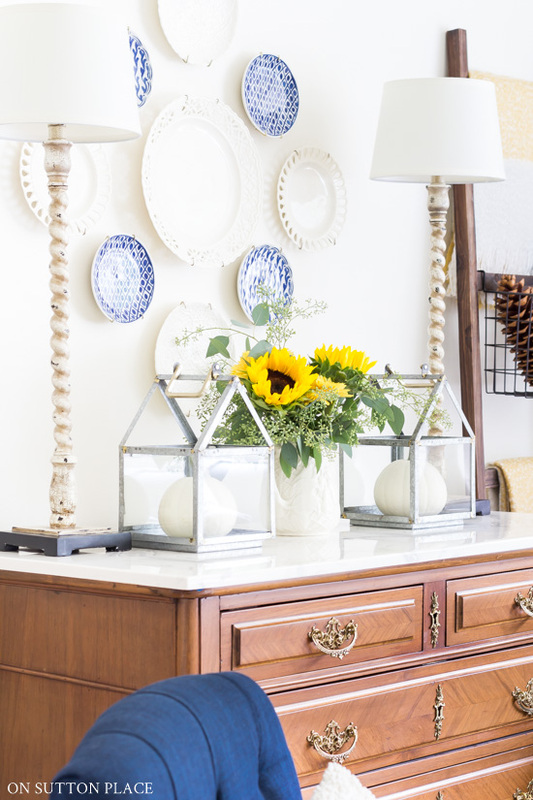 Transitioning your decor from summer to fall is easy if you add just a few touches that can be accomplished in hardly any time at all. 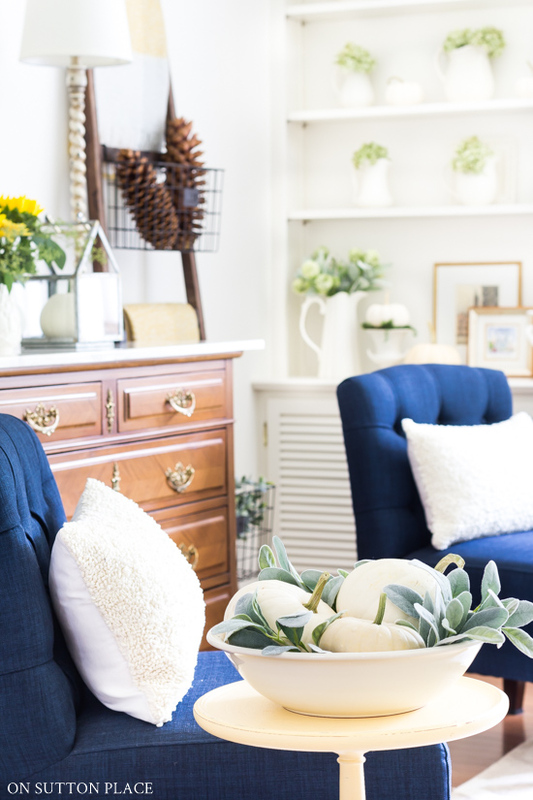 Today I’m joining Krista from The Happy Housie and my Seasonal Simplicity crew for an extravaganza of DIY fall decor ideas and inspiration. If you are visiting from Taryn Whiteaker, welcome! 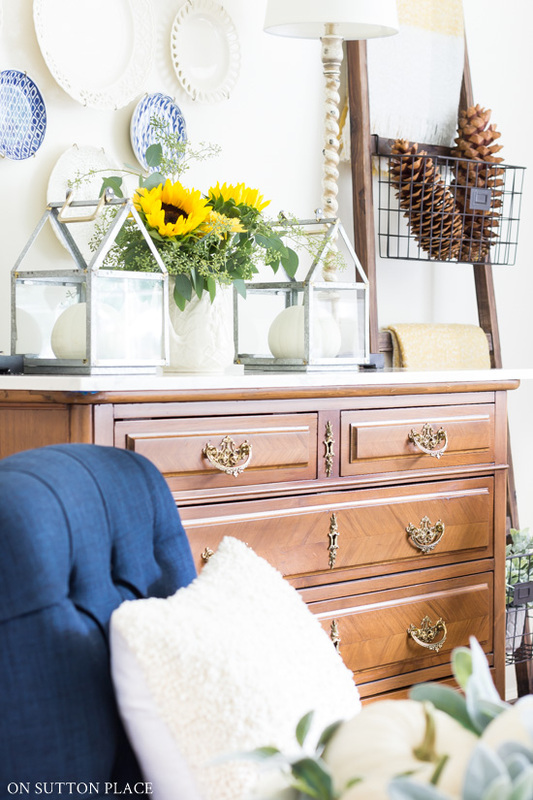 DIY Fall Decor Ideas to Greet the Season! 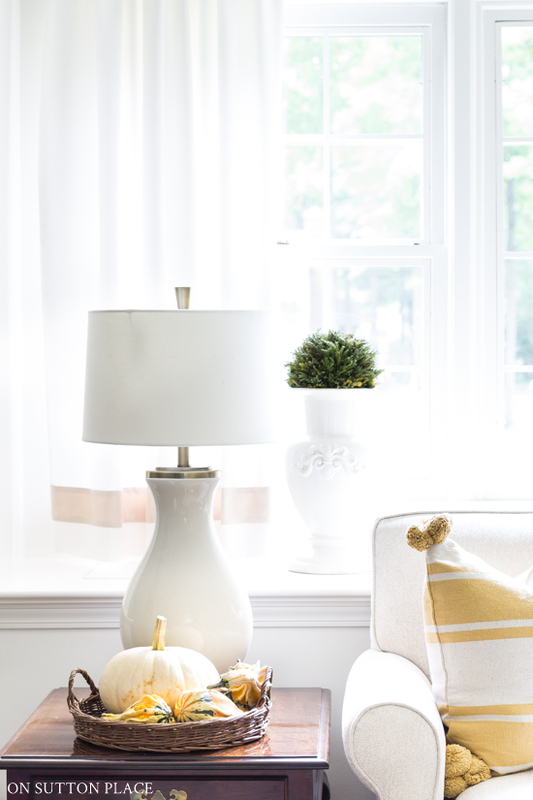 Decorating with pumpkins is one of the easiest ways to bring a touch of autumn warmth into your home. Sprinkling different sizes of pumpkins here and there around your space adds just the right amount of texture and interest. This year I went with real pumpkins and kept them all neutral in color. When it comes to deciding the color of your pumpkins, there are so many choices these days so simply choose what you love. Make sure to give them a bath before you spread them around! I love the day, usually in late summer, when I walk into the grocery store and spy sunflowers in the flower section. 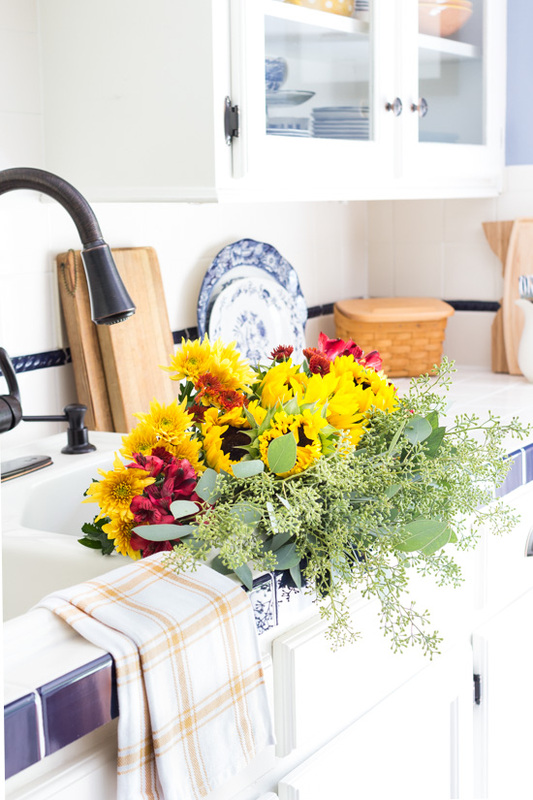 Fresh flowers are one of the small things I treat myself to on a regular basis. 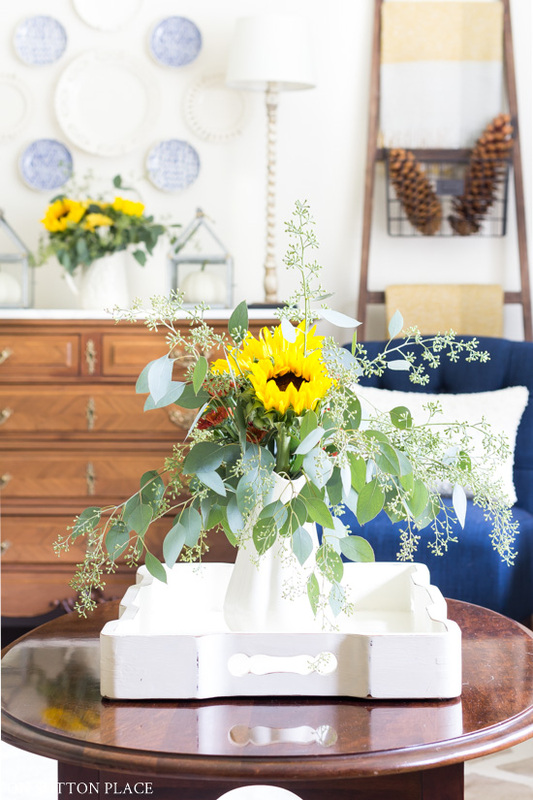 It’s an easy and inexpensive way to brighten your day and add a natural element to your decor at the same time. Keep dried flowers in mind too. Dried hydrangeas are perfect for fall decor. I let my limelight hydrangeas dry on the bush so when I brought them in, they were already a dark green with burgundy around the edges. Along with flowers, don’t forget things like pine cones, tree branches, and acorns. When I think of fall colors, an array of earth tones comes to mind. Copper, gold, russet, dark green, brown. 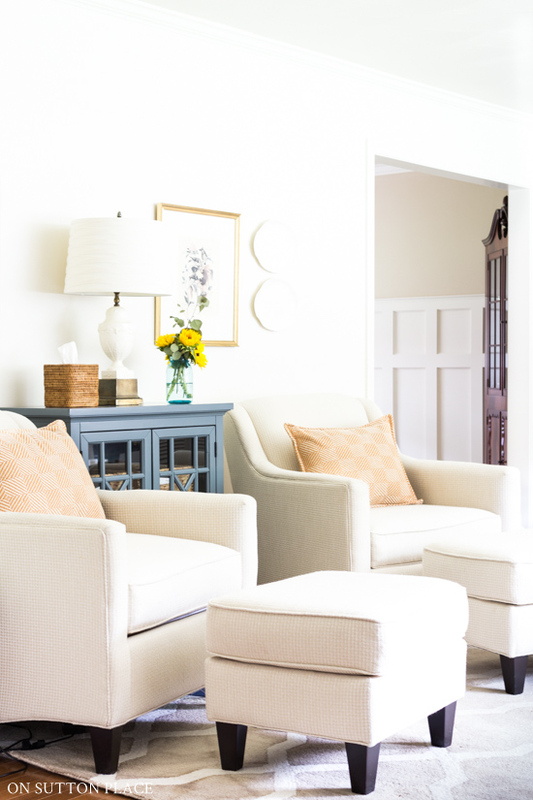 Adding these colors of the season to your décor is easy if you stick to small items like pillows and throw blankets. Be true to your personal style, but switch up the colors a bit and add autumnal shades. Now it’s time to send you along to Norma’s blog, Paint Me Pink. 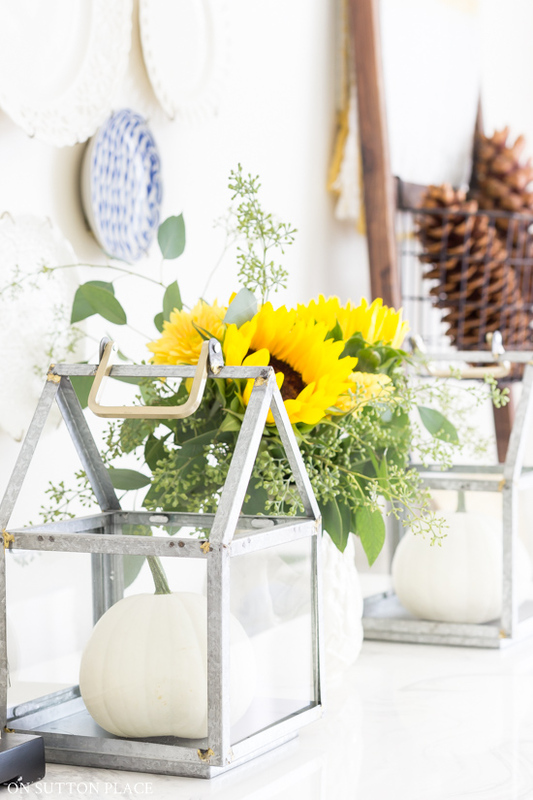 After that, make sure to visit the other links for even more DIY fall decor ideas. 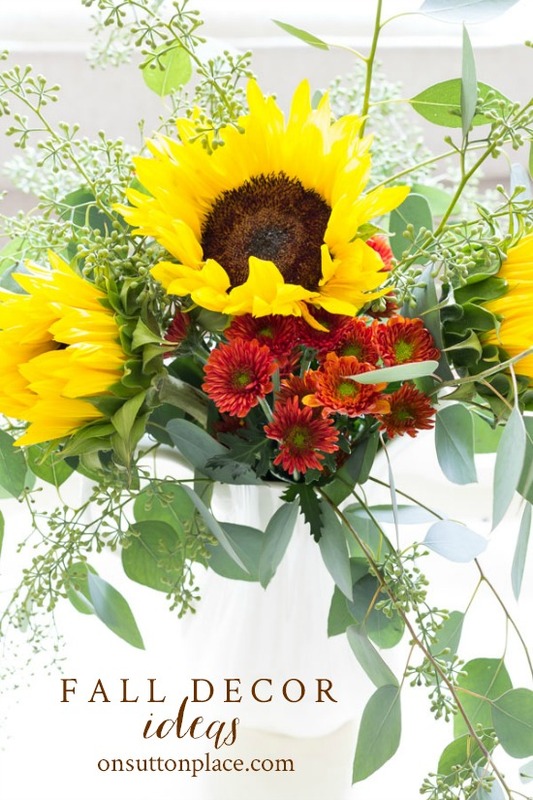 Love all the natural touches especially the sunflowers. 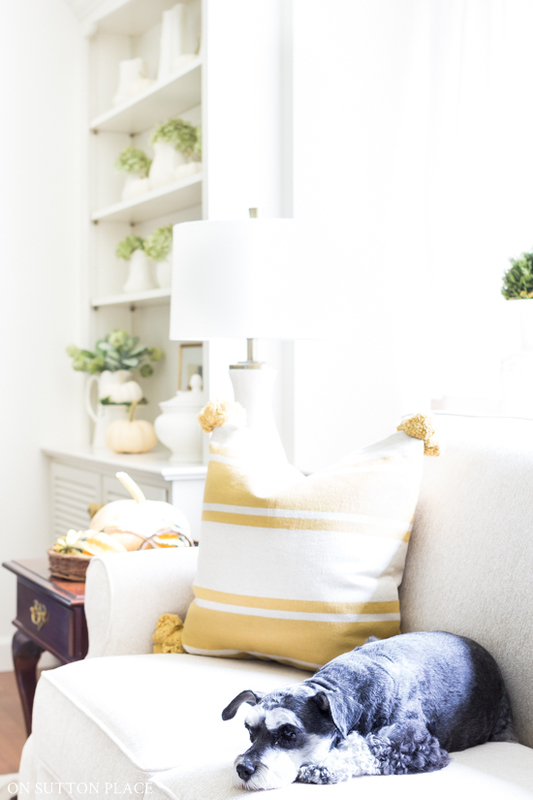 So homey ~ love the striped pillow with tassels & sweet pooch ! SO lovely, Ann. 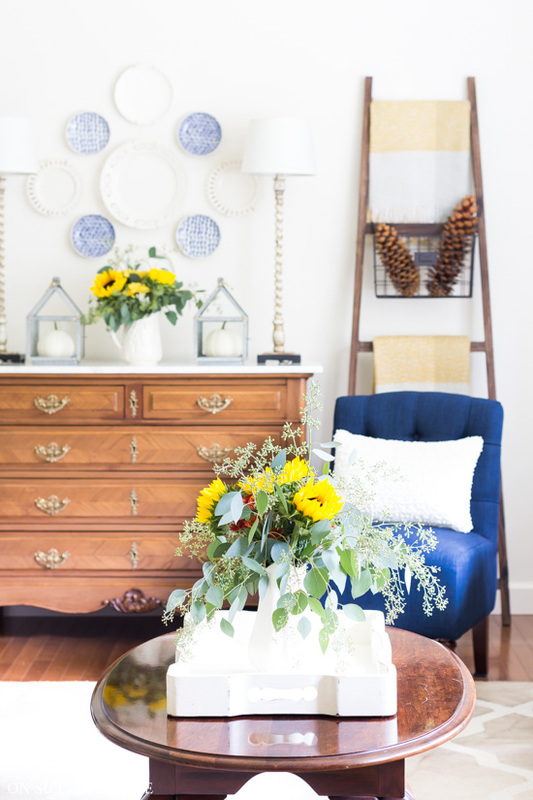 I just love the light and airy envelope with your pops of colour – and how beautifully you have mixed in a fall feel with non-traditional blues (my fave!). Thanks so much for being part of this tour!